FINALLY, DIRTY BLOOD 3 IS HERE! Let me first gush about the amazing cover art for BLOOD BOND, I don't know where Heather gets her art but it is amazing! It's consistent with the first two books except for the color, it's now blue as opposed to the green hues Dirty Blood and Cold Blood shared and I think this minor change is reflective of how the story is evolving. I remember mentioning a prophecy that involved Tara Godfrey in Cold Blood and it's starting to unfold in BLOOD BOND. Tara is on her way to becoming an Alpha despite fighting off her urge to shift into a werewolf but it seems being pack leader is really her destiny and it looks like she's a natural too. Fate has a funny way of realigning Tara with this inevitable role starting with her ex-boyfriend George. Tara finally found a way to counter Miles' attack on George but the flip side is she now has a deep emotional connection with her ex like how a pack is connected to each other. I truly found this development in Tara and George's relationship funny and very awkward especially on those moments where Tara and Wes are making out. I can't help but LOL when Tara felt George's embarrassment through their bond knowing that she's getting hot and heavy with Wes. Speaking of Wesley St. John, damn this boy is making me hot and bothered too! I told Heather I'll take him if Tara decides to go with Alex. I'm glad that I got more time with Wes here as opposed to his brief cameos in Cold Blood. And speaking of Tara's men, I am a little worried about this loose love quadrangle we have here in, BLOOD BOND, with Wes, Alex and George. I pray that Tara isn't going to turn out like Zoey (House of Night) with all these boys chasing her around. But it looks like Wes has the girl and I wish Alex just relents and Heather assured me that George is moving to the friend zone so that's a relief. This series just keeps getting better with every volume. If I may say so, Heather is even bolder in BLOOD BOND, barely 25% into the story and someone dies and this trend keeps on happening that I'm fearful one of the core characters might bite the dust just for effect. And aside from the great action sequences, how cool is Heather's scientific jargon to support all these talks about scientific experiments and differences in the DNA strain between her creatures?! Very impressive if you ask me. I like a writer who's world is as great and detailed as her imagination. I so love this series, the direction of the story and the distinct voices of the characters. 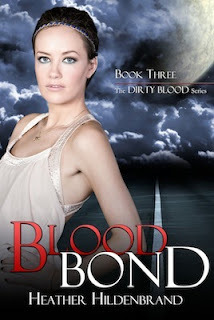 IMHO BLOOD BOND is the best of the trilogy so far and I am so excited to read where Heather is taking us when the next Dirty Blood book comes out. Hmm not sure who my favorite werewolf would be, I know I've got one, but I'm coming up blank lol. I'll probably think of one later :) Great review Braine and thanks for the giveaway! I have many favorites from my books but my daughter loves this series and I am not sure who she likes. Wesley is doing hot things to you Miss B....lol!! You need to buy a fan! Alcide is my favorite werewolf, but the character from the books, not the tv show. HHmm... I really like Brandon from Fulll Moon by Ellen Schreiber and Lucas from Shadow Falls by C. C. Hunter... Thank you for this!!! Great review <3 I loved Cold Blood and really enjoyed Heathers writing all around. Oh and I am supoer excited that there is more time with Wes <3!!! LOL...Jacob? I really don't know. I don't really have one. Thanks!